There are reportedly over 2,000 books about the Beatles. I’ve read probably between five and ten of them. Not a whole lot by some standards, but – along with the many print and online articles I’ve read over the years – I’ve got a fair to very good knowledge of the band. Yet, Hunter Davies’ new book, The Beatles Lyrics, is still refreshing to read. He actually manages to offer something new to the repertoire by taking a close and often witty look at each of their songs and by comparing (as much as possible with what’s available) early and later drafts of the lyrics. Davies has the distinction of being the journalist most suited to writing this type of book, as he wrote the only authorized biography of the Beatles, published back in 1968. He spent almost two years working on that bio and became friends with the band, particularly with McCartney. During this time he kept fragments and full-texts of song lyrics, usually written in John, Paul or George’s hand, as research material for his book. Some of these scrawled words are also decorated with doodles and sketches by the Beatles. 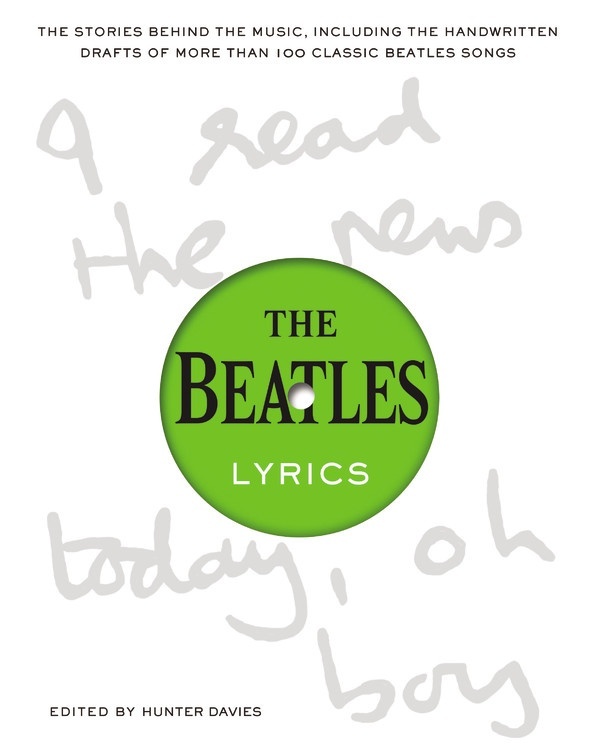 Along with that collection, he’s managed to track down a wide array of similar handwritten Beatles lyrics in the collections of other institutions and private collectors for this new book. The result is a fascinating look at some of the most creative minds in pop music’s history, as many of the lyrics exist in multiple versions, a line or two taken out here, a word substituted there. These songs, dissected by listeners and writers for decades now, are often cast in a new light as we get glimpses of the thought processes of the writers. The Beatles are more revered now than when they were recording 45 years ago. “Another book on the Beatles? !” “Another online feature, another magazine article? !”, you might exclaim. It’s easy to get jaded with the onslaught of Beatles hype. The Beatles Lyrics reminds us that they really were that great (well, close to it at least) and is one of the best music books of recent years. And it’s just plain fun to read. How will history understand the Beatles? Time, recorded history, and the music itself will speak to future generations about a time when music inextricably changed. Will people in the future have a context about the spark of creativity held by the Beatles, and will people have insight into this phenomenon? It is through the work of historians, archivists, and researchers who offer an extended look inside the world of artists, that we are better able to understand the complex pathways that are the gift of music.